Manor College hosted a dialogue featuring Minister Serhiy Kvit, Alex Kuzma and Dr. Andriy Zagorodnyuk discussing the most crucial areas of educational reform needed in Ukraine today. 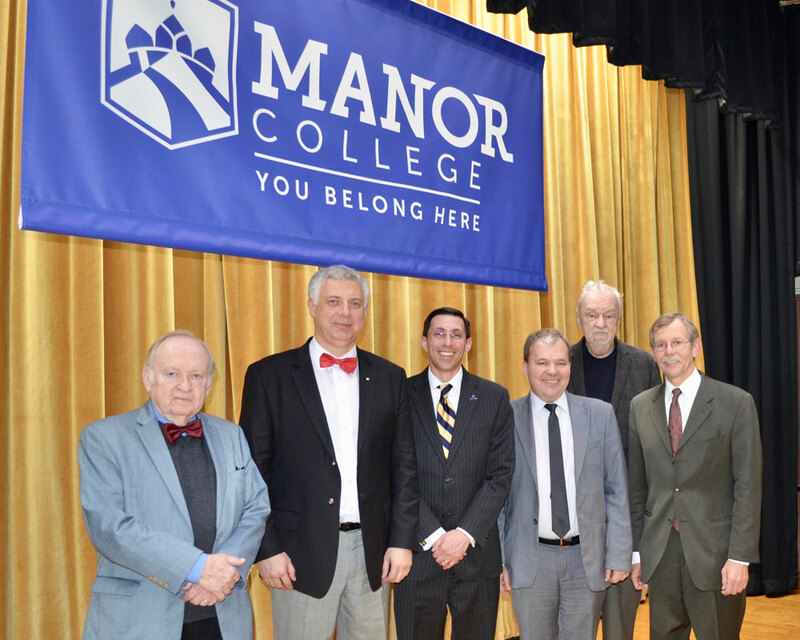 Over 100 members of the Ukrainian-American community traveled from New York, New Jersey, Delaware, Washington, D.C. and Pennsylvania to gather in the Manor College auditorium to be apart of Ukraine: Education as the Battlefront of Democracy. The dialogue examined the most crucial areas of educational reform needed in Ukraine in order to protect and preserve free and democratic ideals. Dialogue moderator, Dr. Albert Kipa, Former Rector (President) of Ukrainian Free University in Munich, Germany, and Professor Laureate of Comparative Literature, Muhlenberg College opened the dialogue by sharing a few well-known quotes defining the word “education” and said, “education tries to bring the best out of … humankind.” Kipa went on to say that the purpose of this dialogue is to talk about what the United States can do offer Ukraine greater stability in our world. Other speakers included Dr. Andriy V. Zagorodnyuk, Vice-Rector of Vasyl Stefanyk Precarpathian National University, who focused on the challenges his university faces. Zagorodnyuk shared some impressive statistics indicating that the Precarpathian University is ranked 4th in Western Ukraine and 16th in Ukraine. Zagorodnyuk also discussed the happenings at Science Park, a brand of the university that focuses on scientific research. One project that he is currently working with is focusing on the effects of aging of neurons when calories are restricted. This was demonstrative evidence that while some educational corruptions exist in Ukraine, the Precarpathian University can be a model for the other 900 or so institutions of higher education. Stay tuned! Manor College is going to continue host Ukrainian focused dialogues every semester and on May 25, 2017 at 5pm, Congressman Brendan Boyle along with some fellow members of the Ukrainian Caucus will be having a congressional hearing / town hall styled event on Manor’s campus open to the community.